What does it make you feel? 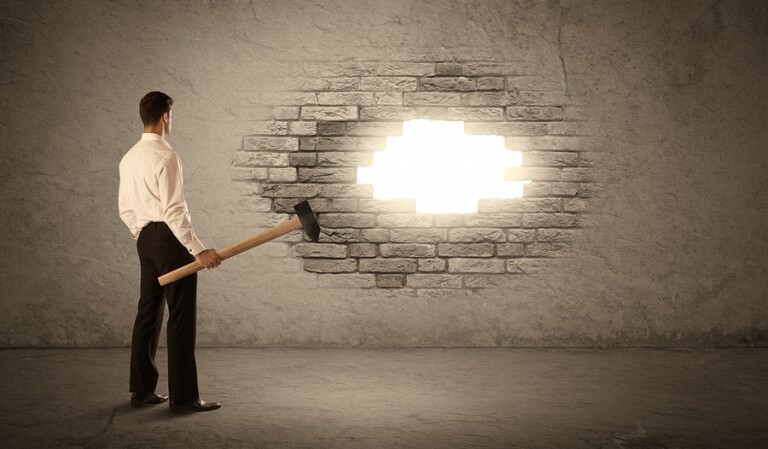 What concepts are associated with it in your mind? What would you think of a group if someone told you it was a “cult”? What would you think of someone who joined that group? “Cult” has become one of the few remaining socially acceptable slur words. It provokes fear and suspicion and is used to vilify and discredit alternative spiritual groups. Because these “cult” stereotypes exist in people’s minds, almost any small spiritual group can trigger the “cult” label and its negative associations, regardless of whether they have done anything wrong. The “cult” label and characteristics associated with it have become an unseen dividing line in our society, separating spiritual options considered legitimate or mainstream from those options considered to be deviant and unacceptable. If you happen to be interested in pursuing a form of spirituality that is on the wrong side of that line, you can experience the consequences first hand. This article will explore how the “cult” stigma functions to keep that line in place. Some spiritual activities seem normal, mainstream, and well-accepted. But put the “cult” label on them and they can feel quite different. There are few labels more socially damaging than “cult.” It places a group outside the limits of what’s acceptable in society. It evokes an image of something strange, harmful, and dangerous. Not many words can so quickly transform the impression of a group or person and with such a devastating impact. The destructive power of this word is not accidental. Labelling a group a “cult” is a fundamental weapon used by the anti-cult movement — a social movement working to marginalize, stigmatize, and restrict the rights of groups that fall outside of the culturally-accepted status quo of mainstream religion or commercial spirituality. The fact that the term “cult” evokes negative impressions is somewhat self-evident, but several academic studies provide strong evidence to support this claim. Of those surveyed, 81.4% said they would feel either very or somewhat uncomfortable about their neighbour joining a “cult.” On the other hand, when asked the same question about their neighbour joining a “New Christian Church” the results were diametrically opposed: 88.7% of those surveyed were either very or somewhat comfortable with their neighbour’s choice in this scenario. Note that in both cases, the respondent had no other information about their neighbour or the group in question beyond the term used to describe it. This is the power of a word. The Nebraska study demonstrates how the word “cult” by itself evokes deeply negative associations. However, another research study goes even further, demonstrating that the negative associations of the “cult” label can completely influence our perception of a situation. Depending on whether or not the “cult” label is invoked, we might find the exact same situation either acceptable or objectionable. In this second study, respondents were provided with a scenario of a young man joining a group and his experiences being “indoctrinated.” Some respondents were told the young man joined the Marines, in other cases the Catholic Church, and in other cases the “Moonies” (a nickname for the Unification Church, a new religious movement that has been attacked by the anti-cult movement). Although nothing in the scenario was different except the name of the group, respondents were far more likely to characterize the process as “brainwashing” in the case of the Moonies. 3 As these results demonstrate, the influence of the “cult” label is strong enough to cause people to view certain activities in a negative light if done by a “cult” but find them perfectly acceptable if done by another type of group. So what IS a “cult” anyways? Given that it has such negative connotations, it is even more alarming that there are no precise rules or guidelines for how the word “cult” can be applied. Both definitions are extremely ambiguous and subjective; the gauge for what makes a “cult” is how “others” around the group perceive it, rather than any objective traits that a group might possess. Applying the ‘cult’ label to someone can easily place a social stigma on them and place them outside of what is acceptable in society. These definitions create a dangerous circular logic. If people regard a small group as “extreme or dangerous”, “strange”, or “imposing excessive control”, that group then meets the definition of a cult. However, as the research above demonstrates, the very act of labeling a group as a “cult” can influence people to perceive them as extreme, dangerous, or excessively controlling. Effectively speaking, any group that someone decides to call a “cult” can then become a “cult” by definition due to the perceptions the word can create. How did the word “cult” gain its power? How did the word “cult” gain such negative connotations? And how did these connotations acquire such widespread acceptance, even if most people have had little or no personal experience with any kind of “cult”? There have been two main steps to this process. The first has been the creation of a new category for certain spiritual groups, which was given the label of “cult”. The second step has been associating that word with vivid and highly publicized negative events, which has given it a deep significance shared and understood by a broad majority of people. Theban pottery art of Dionysus and Ariadne. ca. 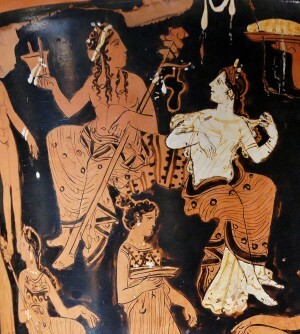 400-375 BC, a tribute to the cult of Dionysus, which traces back to Mycenaean Greece and which played a large role in Greek and later Roman mythology. “Cult” has historically possessed a neutral or even positive sense. It is derived from a Latin word signifying devotion and religious worship, and the English word originally held that same meaning — for example, “the cult of Dionysus” would refer to those who worshipped Dionysus. The word acquired an additional negative sense in the 1930s, when it was adopted by Christian writers to describe non-orthdox Christian movements such as the Church of Latter-Day Saints (Mormons) or the Jehovah’s Witnesses. These authors used “cult” in much the same way the term “heresy” has been used in other times. In the 1970s, a secular anti-cult movement emerged and adapted the term “cult” to their own purposes. They defined “cults” not in terms of what they believed but in how they supposedly behaved. According to their claims, “cults” were groups that recruited using deception, manipulated and abused their members, practiced “brainwashing”, and posed a danger to society. Given that this is the meaning of the word that has become most commonly understood today, it is surprising to note it is less than 50 years old. But are these efforts enough to explain the widespread familiarity with the concept among the general public and the deeply negative views most people hold of “cults”? How is it that the supposed existence and evils of “destructive cults” came to be an accepted belief in society? a mental structure of preconceived ideas, a framework representing some aspect of the world, or a system of organizing and perceiving new information. Put more simply, schemata are sets of concepts that people use in understanding the world and absorbing information. When confronted with new phenomena, people tend to fit it into an existing schema based on perceived similarities, even at the cost of ignoring or distorting other attributes. Additionally he cites research stating that negative information as well as specific, highly vivid incidents are both likely to bias a schema as opposed to statistical/objective data. 9 This means that a person’s impression of a category they have little experience of will tend to skew towards the negative and sensationalistic information they have already absorbed. For most people, the schematic frame of reference for the “cult” category is heavily influenced by the representations of and information about so-called “cults” they have most exposure too — those found in the popular media. 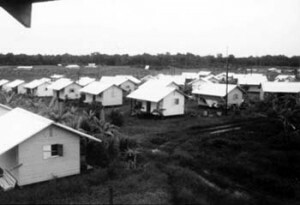 Jonestown houses — the infamous location in Guayana where a massacre became a major catalyst for the anti-cult movement’s popularity. Americans were justifiably horrified by what they saw, and almost all Americans paid attention: a 1978 survey indicated that 98% of Americans were familiar with the Jonestown incidents. This level of awareness was equalled only by certain events in World War II such as Pearl Harbour. 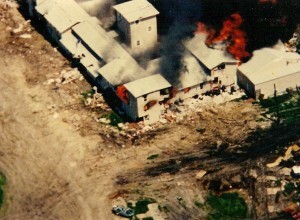 The Branch Davidian Mount Carmel Center engulfed in flames on April 19, 1993. Another significant “cult” incident publicized in the media is the stand-off between forces of the US government and the Branch Davidian spiritual group in Waco, Texas. After a failed raid of the Branch Davidian community, a militarized police force surrounded them in a tense 51-day stand-off. It ended only when the compound was set on fire, after which 76 group members, including numerous children, lost their lives. Of course, there are massive controversies surrounding both these events. These controversies include allegations of CIA involvement in Jonestown and the extremely aggressive actions of the government agencies conducting the siege in Waco, which some claim may have been influenced by the involvement of an anti-cult activist (who was advising the FBI during the siege). Neither of these two events are straightforward. But most members of the public are not familiar with any evidence that contradicts the official stories. Furthermore, anyone questioning those narratives is likely to be ridiculed as a “conspiracy theorist”. 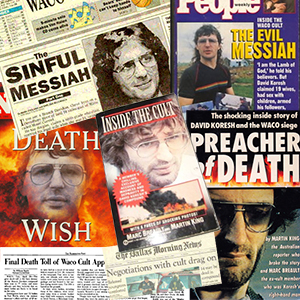 The most memorable details about these events are not the unanswered questions but rather those images that are bizarre and gruesome: dead “cultists” laid out in rows, the cyanide-laced Kool-Aid, stories of sexually predatory “cult” leaders, a crazy looking David Koresh on the cover of Time Magazine, and other similarly horrifying scenes. What information do you think the public has remembered? It is hard to overestimate how significant and powerful the events of Jonestown (and a tiny handful of similar events) have been in defining the “cult” category. The corresponding impact on thousands of innocent spiritual groups is equally huge. Since this small set of violent events has been given extensive, negative, and vivid coverage in the media in association with “cults”, these events have become part of the “cult” schema in the minds of the public and easily associated with all other groups to which that label is applied. The ACM and the mass media’s spread of hysteria surrounding “dangerous cults” indiscriminately conflates small spiritual groups and minority religions with the dangerous cult stigma by default. In this way, the “cult” rhetoric of the ACM conflates thousands of mostly law-abiding but unheard-of groups with a very small number of sensationalized and well-known violent groups. The result is that the characteristics of the violent minority become representative of the whole category, and the ACM effectively brands all alternative spiritual groups as another Jonestown waiting to happen. To realize how absurd and unjust this is, consider that the small number of groups who have actually engaged in physically destructive behaviour represents less than one tenth of 1% of total religions worldwide, which some scholars estimate to number in the tens of thousands. 19 Unfortunately, such statistics have become irrelevant when it comes to the public perception; highly vivid and highly negative incidents are more memorable than facts and data. As described above, there are a set of stereotyped characteristics that have become associated with the “cult” label. For example, when you hear the word “cult”, you may think of a sexually abusive leader, deceptive recruitment techniques, mass suicide, “mind control”, and other traits. When a group is labelled as a “cult”, it is easy for all of these stereotyped characteristics to become associated with that group, regardless of the objective reality. Research has shown we can even interpret identical sets of facts differently when the “cult” label is invoked. This process can work in reverse as well: if we encounter a group with a similarity to one or more of the characteristics that we associate with “cults”, then it is possible to uncritically apply the “cult” label and stereotypes to that group, even if the similarity to the destructive “cult” archetypes is extremely superficial. For example, if we encounter a small group following a spiritual teacher, we might automatically perceive that teacher with suspicion, assume they are manipulating their students or are after some financial gain or sexual gratification, and so on. This may be entirely inaccurate, but the match between a particular trait (a group with a spiritual teacher) and a pre-programmed “cult” characteristic (“cults” have spiritual teachers) is enough to trigger the schema containing many negative associations. These characteristics or “cult criteria” have not emerged in a vacuum: just as the “cult” label has been actively promoted by the ACM, so too have a set of criteria of how “cults” supposedly behave. The wording of these characteristics immediately brings to mind abusive groups that are clearly in violation of common-sense ethical boundaries, such as the groups that have become household names through violence or controversy. However, a more thoughtful analysis of these characteristics reveals massive ambiguity. These “cult” traits might just as accurately describe major religions, peaceful spiritual communities, or mystical groups from across the ages. So what are the traits of “cultic groups”? Here are a selection of these supposed characteristics, along with some analysis. At what point does religious commitment become “excessive”? Who decides? This characteristic assumes that deep religious devotion and commitment to a spiritual teacher must be misguided. There is also a strong implicit skepticism about the validity of such religious experience and the legitimacy of such teachers. Surely committed Christians have a zealous commitment to the teachings of Christ, just as Muslims are committed to the teachings of the Prophet Mohammad, and Jews regard the Torah handed down by Moses as spiritual law. No doubt all these groups regard the belief systems, ideologies, and practices associated with their faiths as the Truth. Why does this behaviour become “cultic” if done in a modern-day context? Questioning and dissent seem healthy and obviously can be in certain situations. But also consider that in many religions, “doubt” is seen as an opposite to faith. How can we distinguish between a group that discourages critical thinking as opposed to a group that encourages faith in something greater than what the eye can see? Based on this characteristic, any group encouraging faith (a very fundamental religious principle) could be seen as “cultic”. A meditation Buddhist monk at a retreat in Indonesia. Meditation and chanting are time-honoured spiritual practices in Buddhism and Hinduism, both major spiritual traditions. There are numerous scientific studies on the psychological and physical benefits of meditation. Does any practice of meditation or chanting make a group “cultic” — or only when these techniques are used beyond some hypothetical limit? Who gets to decide where that limit is? The same questions could be asked of work routines, which are a form of spiritual practice in many communities. This characteristic evokes a horrible image of controlling spiritual leaders. But then consider that ancient spiritual texts contain many prohibitions and proscriptions regarding marriage, mode of dress, how to eat, how to behave, how much to give to charity, and so on. What differentiates these rules, which lie at the heart of many established religions, from spiritual guidelines given today? Virtually all established spiritual groups begin with a figure who is considered a special being on a spiritual mission of some kind. Jesus, Krishna, Mohammad, Moses, Buddha, Zoroaster, and many others all share this trait. This characteristic seems to take for granted that there is no deeper spiritual truth in the world — if we accept this, then of course any group claiming to have found such a truth is probably misguided. But why is this assumption treated as an obvious fact? Is it not possible for a modern-day group to be led by a special being or to have a special mission? This characteristic would immediately label all the ancient spiritual figures mentioned above as “cult leaders”, were they to emerge today. Any group that deviates from or is critical of social norms may be considered to have a “polarized” mentality. Observe this characteristic to the letter, and you ironically prohibit dissent from and demand conformity with the wider society. 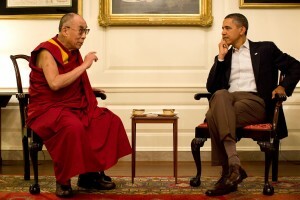 The 14th Dalai Lama, “God-King” of Tibet, in a discussion with US president Barack Obama, 2011. Photo credit: Pete Souza. Licensed under Public Domain via Wikimedia Commons. All spiritual leaders are accountable to the secular authorities of the countries in which they live or visit, should they break the law. In terms of spiritual matters, every spiritual group governs themselves in the way they choose. For example, the Catholic Pope is considered infallible to Catholics, his decisions cannot be judged, and he effectively cannot be removed from office in any way. Similarly the widely-respected Dalai Lama, who has been acclaimed as the world’s most influential spiritual person, is actually considered a “God-King” by his Tibetan followers. One may find this to be a wise or unwise policy, but to claim that a spiritual leader with authority is uniquely a “cult characteristic” and is unlike “mainstream religious denominations” does not hold up to serious scrutiny. Based upon this characteristic, spiritual adherents are not allowed to change, adopt new relationships or leave old ones, or modify their goals and interests based on their spirituality. In other words, the only “safe” form of spirituality is one that produces no change. 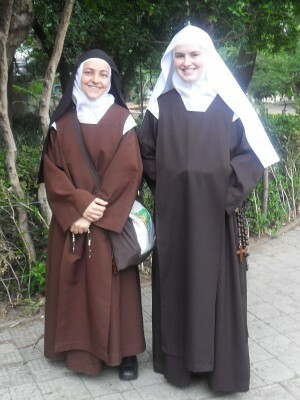 Carmelite nun and novice in Brazil — one mainstream example of spiritual adherents who devote much time and energy to their spiritual practice as a way of life. Most major religions focus on missionary work or “spreading the gospel” as a religious duty. At what point does it become preoccupation? This characteristic effectively prohibits small spiritual groups from attempting to grow and spread their message, which is a fundamental activity for their survival. All organizations require funds to carry out their mission. How do we distinguish legitimate fund-raising from financial preoccupation? This characteristic prohibits spiritual groups from attempting to support themselves financially. 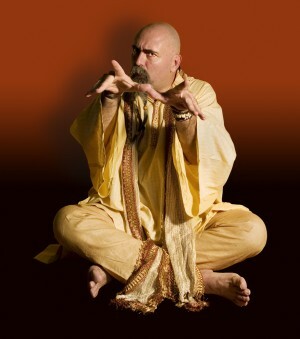 Spiritually-oriented activity is a key component of many spiritual groups and traditions. Even if someone wanted to devote their whole lives to spiritual activity, is that not a socially valid choice to make? This characteristic establishes an arbitrary threshold of spiritual dedication and says that anyone who goes beyond it is in a “cult”. 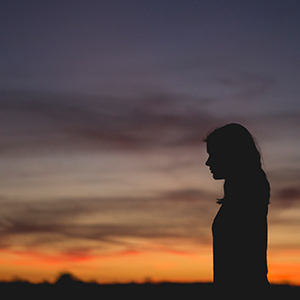 These “cult” characteristics contain many value judgements about spirituality, cloaked in the respectable garb of clinical language, as well as assumptions about what is important in life, how we should behave, and the role of spiritual practice. Ultimately, any spiritual group that transgresses against the secular and materialistic values that underly these assumptions is going to fall into the “cult” trap. In the world of the ACM, spirituality can be a hobby, a casual interest, or a cultural affiliation, but not a serious focus of one’s life. These characteristics are also oddly reminiscent of the witch hunts of early modern Europe and New England, where subjective, ambiguous, and often absurd criteria were used to label innocent people as witches. 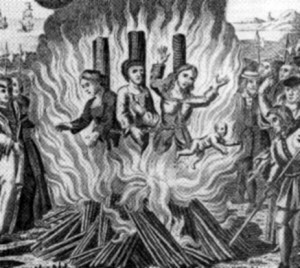 An 1800s depiction of a burning of women accused of allegedly being witches during the infamous medieval witch hunt. Then as now, the witch hunts were driven by moral panics and hysteria about a supposed threat to society. Just as the discovery and condemnation of supposed witches became a self-fulfilling prophecy to “prove” that witches existed, so to has the widespread existence of “destructive cults” became an unquestioned fact due to the one-sided depictions of “cults” in the mass media. Finally, just as witch trials featured a variety of spurious “tests” to determine whether someone was, in fact, a witch, the “cult” characteristics used by the ACM impose often equally impossible or subjective criteria on those organizations seeking to prove they are not a cult. In order to absolutely avoid meeting any “cult” criteria, a spiritual organization would need to have no interested members, no real leader, no spiritual principles, no effort to spread its message, no funds to support itself — in short, it would need to cease operating altogether. Is the ACM attempting to suppress all spiritual organizations of any kind that are not mainstream religions? It is easy to underestimate how widespread the “cult” stigma is, how deeply ingrained, and how damaging it can be. 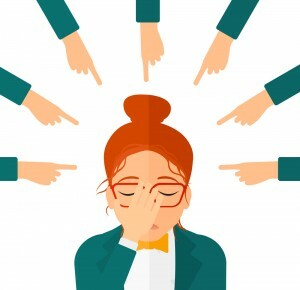 Most of us would object if we heard someone using a racial or religious slur, and yet descriptions of “cults” and “cultists” do not typically rouse a second thought. “Cultists” are depicted as robotic and dehumanized by definition, and thus they do not evoke much sympathy. However, the unnoticed and casual bigotry lurking in the “cult” concept does not just affect a group of strange or destructive people; it affects the choices available to us all. The window for the free exploration of spirituality is being gradually closed and the fundamental human right of freedom of belief is being gradually eroded. The limitations on these freedoms do not have to come from an external force or oppressive laws; people police each other through taboos, social stigma, and family pressures, enforcing limits on the type of spirituality that is acceptable without even realizing it. If we value the right to explore spirituality in freedom, then we need to wake up to this process and reject the “cult” stereotype. Shupe, Spielmann, Stigall, “Cults of Anti-Cultism”, 1980, 45.